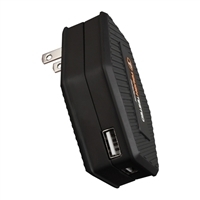 The ToughTested Power Share Pro wall charger is the AC version of the Power Share Pro Car Charger. 3 USB ports share 4.2 Amps of power and technology assures the best, safest, and fastest charge possible. The wall version has 180 degree rotating power blades that offer flexibility for crowded power strips and outlets and rotate for low profile plug-in' behind furniture or objects where space is at a limited.